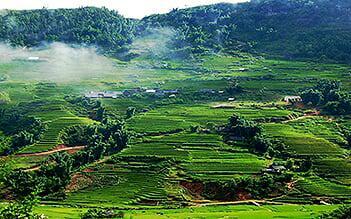 We depart from your hotel at 8:00am to Mai Chau town – Hoa Binh province. This scenic drive takes about three hours. En routes, we pass fields of tapioca and sugar cane as well as rice paddies. After lunch in a traditional stilt house of the Thai people in Poom Coom village, we drive for one hour to Xa Linh village to begin 3 hrs trek through beautiful villages, the gravel tracks and small paths used by the locals. Our destination for this evening is Hang Kia village, home of the H’mong minority people. Dinner and stay overnight as the guests of an H’mong family in a traditional house, situated in a picturesque valley of peach orchards. Breakfast and then we get well and truly off the beaten track as we trek through tropical rain forest, using the local tracks and passing through corn fields as we descend in to Mai Chau Valley. The trek takes around 5 hours and is quite steep in places. Lunch will be provided at the local stall at the foot of the valley. From here, we pass through several ethnic minority villages, long spread out fields decorated with water wheels to make our way to Van village by late afternoon, and then we have time to walk around this charming little white Thai village, enabling us to understand a little more about how the people live. Tonight we will be horned guests in one of their traditional stilt houses. Dinner will be served here and you are able to sample some of their homemade rice wine! Today we have whole day – easy and nice trek passing through several more Thai hamlets. We walk on the valley floor and are surrounded by rice paddies and beautiful scenery. Picnic lunch en route and arrival in Xam Khoe village in the afternoon. Cook, then enjoy the dinner with the host, slumber away after having nips of maize wine. Free time to walk around or chat with local people, then have a good night sleep. Say farewell with the host after breakfast. 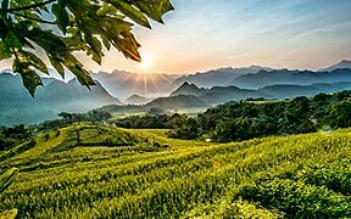 Trek back to Mai Chau valley and Poom Coom village through beautiful rice terraces, inhale peaceful atmosphere here in the morning…Lunch will be served by Thai people, free time for you to stroll around the village in the afternoon. This village is near a small town. So this makes a good chance for you to refresh a bit and prepare for the next challenges of trekking on the following days. Dinner and overnight in Poom Coom village. Leave from the Poom Coom village after breakfast. 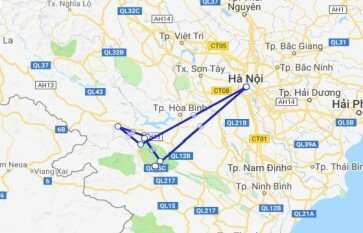 We ride on the road and passing through spectaculars on routes and Ma river around 22km to the Pu Luong Nature Reserve. Get off the bus to unbeaten trek to Duom and Hang village for approximately 2.5 hrs through spectacular mountain scenery, rice paddies, water wheels, talk with lovely local people on the way. If we have more time, children here are very willing to bring you to visit Hang cave, then we spend the night with a local Thai family. Whilst enjoying their hospitality we will discover a little more about their lives and culture. Prepare picnic lunch for the next day. The daily life here starts early, it will be interesting for you to get up, take part in their activities in the morning, take an opportunity to stroll around Hang village before having breakfast served by Thai people. Start our trek at 8 a.m. Today we will be walking for an approximately 5 to 6 hrs. The first hiking is hard with some steep climbs and yet more stream crossings, the next is really glorious with beautiful views of valley, rice terraces, rich rain forest. Picnic lunch on the way at Eo Ken village. Arrival in Hang- the setting of the village is perhaps the most beautiful in Vietnam nestled between steep karst mountains and nice terraces in the afternoon. Spend our second night in a typical Thai eco – stilt house in Kho Muong. Having breakfast, then start for a harder full day of hiking. Continue on through the valley. There are some steep climbs and yet more stream crossings. Trek to an incredible cave, only recently discovered and now protected by the Forest rangers. 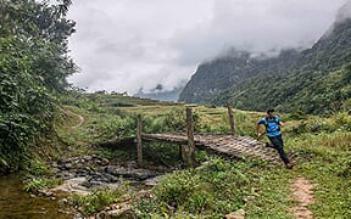 The trekking becomes more remote yet one is never far from a villager tending fields, passing steep limestone mountain, rain forest inside the Pu Luong Nature Reserve to Nua village. After a rough trek, what is more than refreshing yourself with cool stream. This will surely bring you a new experience. Stream bathing! Then picnic lunch will be served here. Homestay condition is very basic. This tour itinerary and tour prices are subject to change without notice, please refer to our terms and condition before booking. Paradise found A magical place in the mountains where time seems to have almost stood still. Walk through unspoilt landscapes where farming is still carried out in the traditional way and cars are not seen! !